During his New Year's Day speech, Kim sent his well wishes for the Winter Olympics in Pyeongchang and offered to send a delegation to the games. North Korea's Kim Jong-un extended what seems to be an olive branch to South Korea. During his annual New Year's Day speech, Kim sent his well wishes for the Winter Olympics in Pyeongchang and offered to send a delegation to participate in the games. The New York Times quoted him as saying, "The North and the South should no longer do anything that would aggravate the situation and must exert efforts to ease military tensions and create a peaceful environment." But Kim had harsher words for the U.S. He warned that his country's nuclear weapons program is a "reality," adding, "I have a nuclear button on the desk in my office." It's been more than a month since North Korea's most recent missile launch. 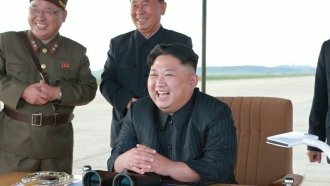 Pyongyang said that missile was tipped with a "super-large" warhead and claims it is capable of "striking the whole" U.S. mainland. When U.S. President Donald Trump was asked about Kim's latest threats, he responded with, "We'll see, we'll see."